Settings are available for adjusting the radio operation, cover art, etc. Select �audio� on the �setup� screen. 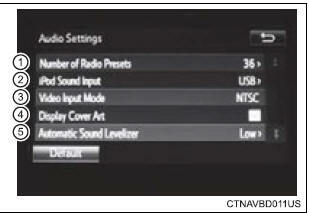 Number of radio presets select the number of radio preset stations. Select �high�, �mid�, �low� or �off�. Asl automatically adjusts the volume and tone quality according to the vehicle speed.